I was standing waiting at the school gate, trying to pretend I didn’t mind that no one was talking to me. The lonely me was hiding under a welcoming smile, a veneer of confidence. Friendly faces passing by but I still felt like an outsider. I stood there like a statue, still and quiet, waiting to leap into the frenetic action of the next 20 minutes. You may think that there is nothing simpler in the world than walking your children 3 whole minute back to the house for lunch but you have not met my children. When I put it like that, it makes you wonder if there is something strange or unusual about my kids. No, it’s not that. They are just perfectly noisy, perfectly boisterous, perfectly cacophonous, perfectly normal kids. The children file out of the door and sit politely on the school step. They have to wait until their teacher calls their names and hands them over to their parents. Why can’t they sit like that at home? Why can’t they sit quietly, without poking the child next to them at home? Why can’t they ever do anything they’re asked at home? His teachers catches me eye. I don’t know her well but I count her among my friends. She once called me a “perfect parent” (little does she know I thought.) She whispers encouraging words to me, “paciencia! Patience!”. Her one word says it all. Somehow she knows. Today she just smiles and Dante comes running. I crouch down to give a kiss. I look into his big blue eyes. He smiles and throws his coat and bag at me before running off. My middle child is five. That sounds big to me, but I know it’s not really. He’s still a ‘big little boy’ rather than a ‘little big boy.’ He loves to run and play and career around the place. He loves to do things by himself. Or at least try. He is quite big really. For his five small years. 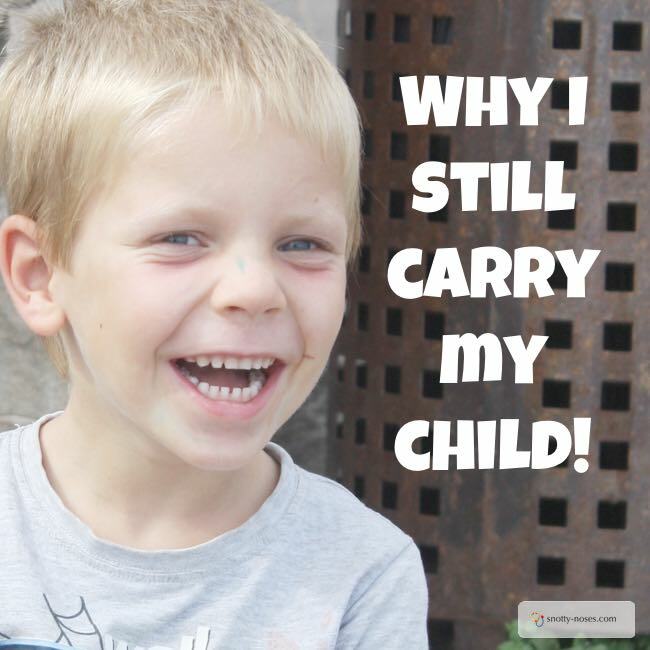 But he often asks me to carry him. He looks up at me with those big blue eyes and says “carry!” And mostly I do. Today I’m tired and laden with things, shopping bags, school bags and coats. I think about the 3 whole minute walk and how he could just walk by himself, if only he felt motivated. I feel frustrated and hot. I don’t really want to carry him. But I do. Even though he’s getting too big and I’d quite like someone to carry me. And all the bags. There are times when I invent games, such as crocodiles in the street, or flying little aeroplane. Or we hold hands and I give him a squeeze and a super boost of energy that sends him flying along the road. Today I pick him up and carry him home. Even though I struggle and he’s getting too big. Even though I know that he can really walk the second he decides he wants to. Because I can. Because right now, I can still pick him up and carry him home. Because right now, he’s asking me too. Because right now, my son is telling me he needs me. In a few years, he really will be too big. In another few years he won’t even want me to walk home with him, let alone carry him. The Inevitable Passing Of Time. Yes, the inevitable passing of time. His older brother walks the 3 whole minutes to school by himself. I don’t have to wait outside of the gate, I don’t get his coat thrown at me. I don’t get to walk home with him. 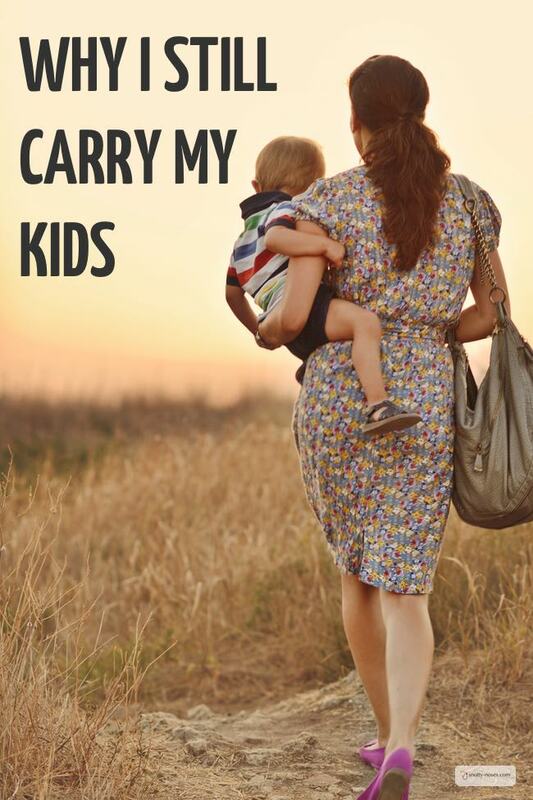 So right now, even though he’s really really heavy and doesn’t really need me to, when he looks at me with those big blue eyes and says that solitary exhausted word “carry!” I remember all these things and smile. I pick him up and carry him home.